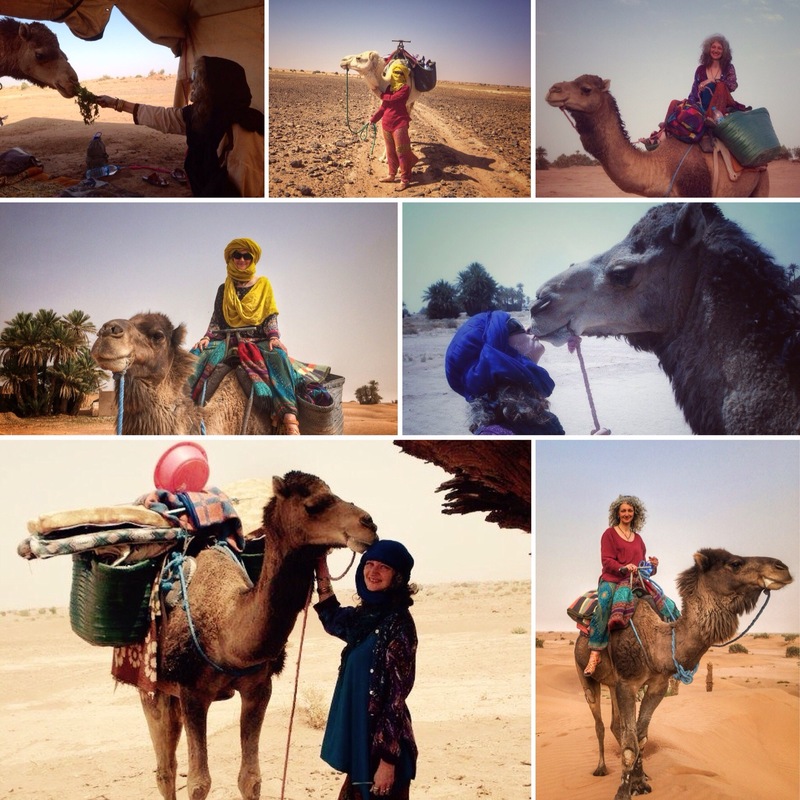 New year in the Sahara! 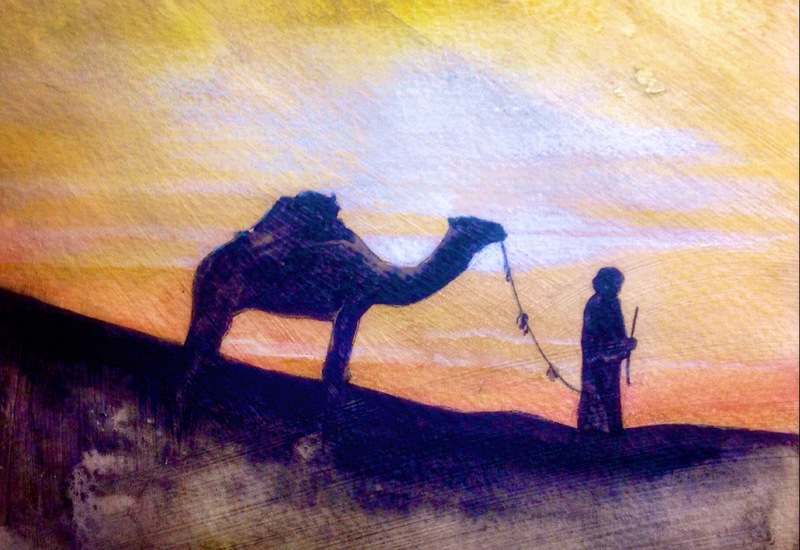 I like camels a lot… And I mean a LOT. 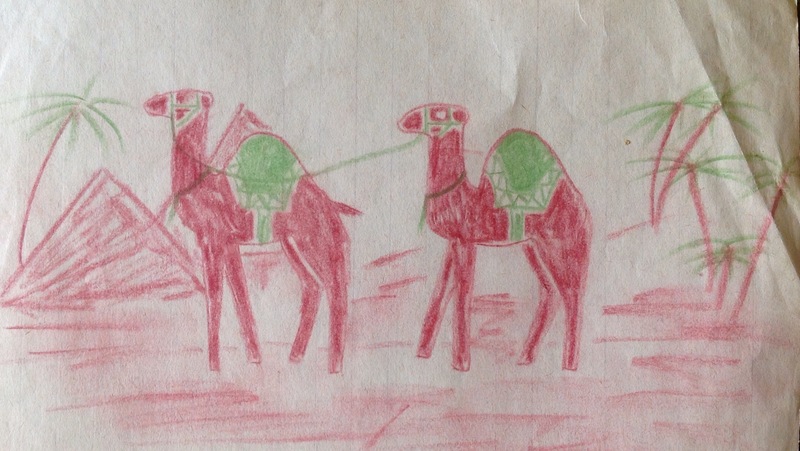 Camels have played a important role in North Africa for thousands of years. 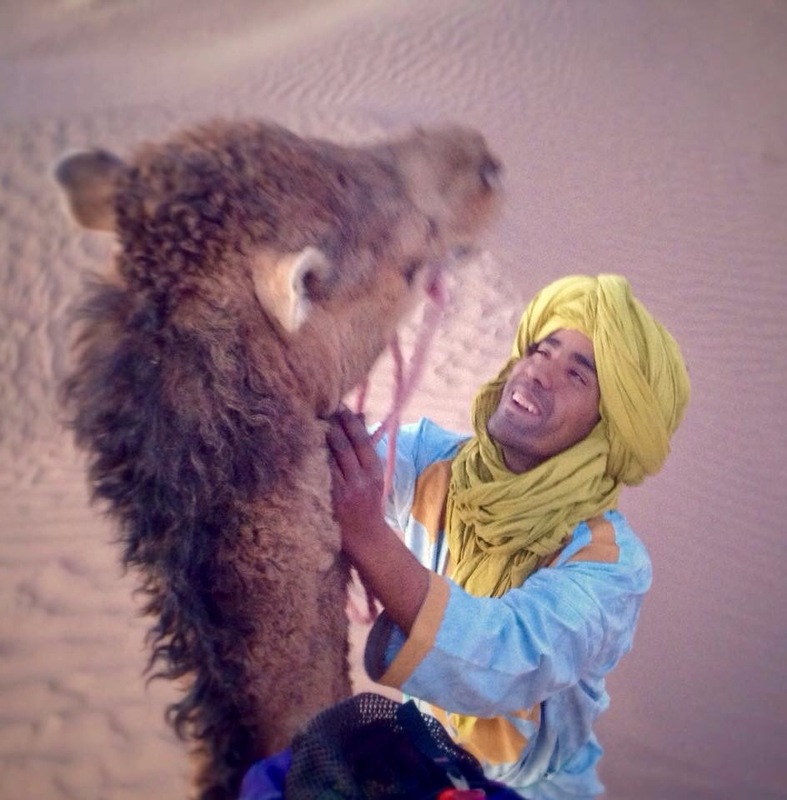 They were probably domesticated some 4000 years ago and up until relatively recently were absolutely essential for travel and trade across the Sahara and this tradition continues today in the desert areas of Morocco. All the camels you see as you travel the desert will belong to someone, there are no truly wild dromedaries left in Africa and the Middle East and only a small number of the Bactrian camel far away in Mongolia that are still wild. There is a feral population in Australia but they were originally taken there as domestic animals. The relationship between the Morrocan nomad people’s and their camels is a complex one, they occupy quite an elevated position as a beast that is so intimately connected with the very survival of the nomad way of life here, and I have seen men embrace them and talk to them with real affection, they are also valuable creatures and take a long time to grow to maturity and train up to be pack or riding animals. A camel takes 15 months to produce a calf and that calf will then take 4 years to mature, much longer than many other domesticated animals. A camel can then live up to 50 years so your relationship with your working camel may be a very long one indeed. The Prophet Mohammed owned three during his life that are quite famous, especially a female called Al-Qaswa. Who I will also write more about later. But they are meat and milk to the people here too. especially at festivals, weddings and celebrations. Although I will not be trying camel meat (which some believe will bestow on you some of its contrariness if you are not careful to cleanse yourself spiritually afterwards) I have tried the milk, which was lovely and I can report didn’t make me any more contrary than I usually am. 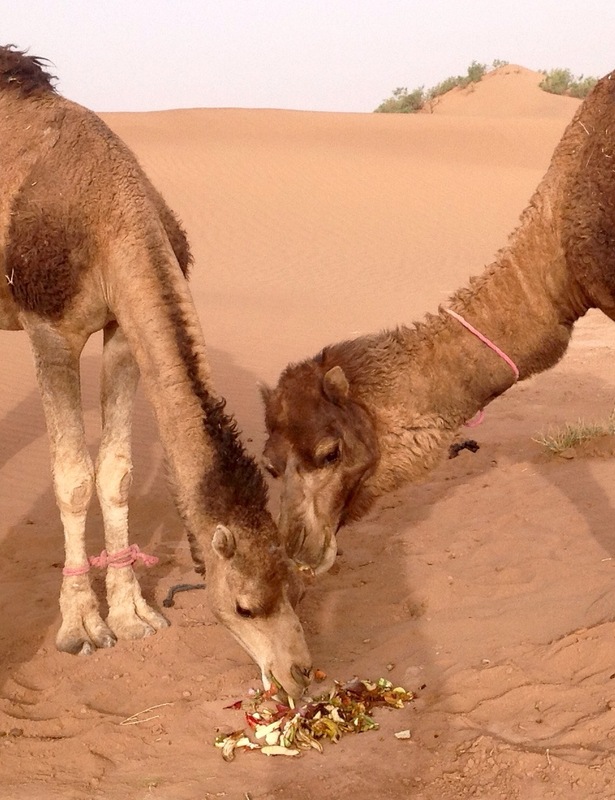 Camel milk is also said to have curative powers, a subject that may be ripe for research. Camels can eat almost anything and during times of scarcity will even eat bones. 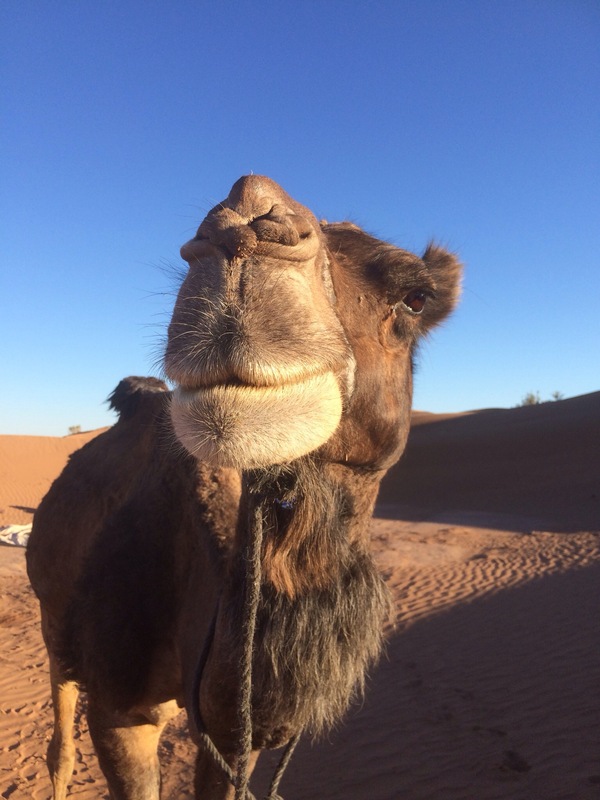 When we travel in the desert with them they ensure nothing from our meals is ever wasted, but as they are particularly fond of dates I think they must have quite a sweet tooth, which is a very Moroccan characteristic too! Their dung arrives already so dry It can be used for building fires, although I have never see it used for this in Morocco. Camel hair can apparently be made into an incense which has the reputation of curing nosebleeds, I haven’t tried this one either, as yet. I think the camels almost magical ability to survive and thrive in the harshest of conditions confers on it a certain sense of the wondrous. So it makes sense to me that these qualities of toughness in the face of adversity as well as its famous contrariness are seen as something that it may be able to pass to others. Some Moroccans also believe that a camel is the only sentient being that is able to see the Djinn, spiritual creatures mentioned in the Qu’ran that exist alongside humans and Angels. During my perambulations around various advice sites looking for more info about this Pronouncement I came across an Imam who replied with dry wit to an earnest enquiry on the issue that regardless of how much devishness is contained in camels (and being bolshy and stubborn is absolutely a sign of the bad guy at work apparently) it was probably good advice not to pray near to them as there is always the chance that one might step on you or take a bite out of you. Not conducive to making a an appropriate connection with the almighty I imagine…I have not been bitten. Yet. ← The ugly beautiful. Or how I learned to love the Camel spider.